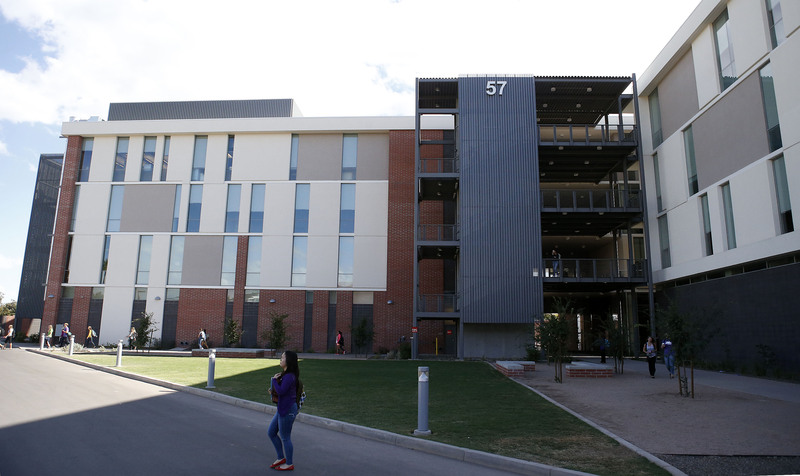 In the heralding of a new era, Grand Canyon University is rolling out a new series of online science, technology, engineering and math (STEM) degrees in subjects ranging from digital design to cybersecurity. The seven bachelor of science degrees represent the tip of the information-age iceberg. GCU is seeking to ramp up its online offerings as it escalates its emphasis on STEM subjects for all students. STEM classes, many of which are held in this building, are increasingly offered online. This initial crop of online STEM degrees, with plans underway to offer more in the future, are the latest moves GCU is making to produce well-trained, highly competitive graduates in these subject areas as well as to make the degrees more accessible. The number of STEM students GCU graduates each year is growing, and so are the number of opportunities to apply their skills, said Dr. Mark Wooden, dean of the College of Science, Engineering and Technology. “There is a huge job market in this area,” Wooden said. According to the Economics & Statistics Administration of the U.S. Department of Commerce, STEM occupations are projected to grow 17 percent from 2008 to 2018, compared to9.8 percent growth for non-STEM occupations. STEM workers command higher wages, earning 26 percent more than their non-STEM counterparts. At the same time, GCU is experiencing rapid growth in both online and ground students. The online population of nearly60,000 students is expected to expand by 6 to8 percent a year, while the ground population of more than 15,000 students is expected to nearly double to 30,000 by 2020, according to President Brian Mueller. The new degrees, which will be launched in 2016, are being offered through CSET, the Colangelo College of Business and the College of Fine Arts and Production, Radda said. They include: CCOB (applied business analytics, applied business information systems),CSET (computer programming, information technology, information technology with an emphasis on cybersecurity), and COFAP (digital design/web design, digital design/animation). Expanding STEM offerings has been at the forefront of GCU’s agenda for several years, Radda said. Known traditionally for its strong nursing and biology programs, GCU is building on that solid core to prepare students to succeed in the fastest growing fields. “In doing that, we have met, and continue to meet regularly, with industry leaders and members of industry boards in computer science, technology and engineering,” Radda said. The fields not only are fast growing, they are high paying. GCU lists the annual median wage for computer and information research scientists, for example, at $102,190. A growing number of students take STEM classes. Many people who have worked in STEM fields for a while have certificates, but they haven’t earned their bachelor’s degrees, said Dr. Michael Sheller, CSET associate dean. The computer science and IT courses are set up to align with the body of knowledge associated with a certification, he said. For example, Microsoft offers a certification in C#, a computer programming language, and GCU has a series of three courses under a bachelor’s degree that dovetails with that certificate, Sheller said. If a student already has taken C# college level classes, he can swap them out for classes in Java, another programming language, or any number of three-course sequences, he said. GCU also is offering nearly three dozen new computer programming and IT classes for traditional students this school year and plans to make them available to online students in the near future, Sheller said. To help manage the growth, GCU hired Dr. Heather Gollnow in October as assistant CSET dean and associate professor of information technology, computer science and computer programming. Read more about her here. Producing STEM-educated graduates helps the Valley and the state because businesses seeking to relocate greatly value the quality of a trained workforce, Mueller said. “We are going to make this a very, very inviting place for companies to create jobs,” he said.